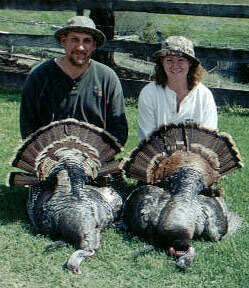 Josh and Lisa show off the gobblers they took during the 2000 California spring turkey season. This was Lisa's first turkey. Her gobbler had a 11.75-inch beard and weighed in at a whopping 22 pounds.